Dear Readers, the plot has thickened regarding the foxes in St Pancras and Islington cemetery this week. 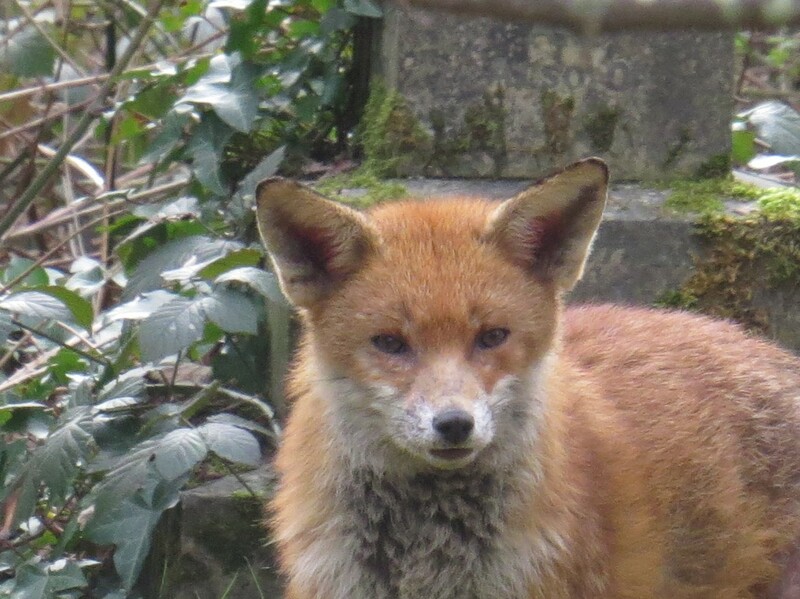 On Monday, B informed me that she had seen three foxes, two with mange and one without. ‘Blimey’, I said, ‘I’m going to have to buy more jam’. As you know, I’ve been trying to medicate the fox in the photo above with a homeopathic remedy from the National Fox Welfare Society, which I’ve snuck into some jam sandwiches. ‘My’ fox seems to be on the road to recovery, much to my amazement – I’d been very skeptical when I’d started the process. 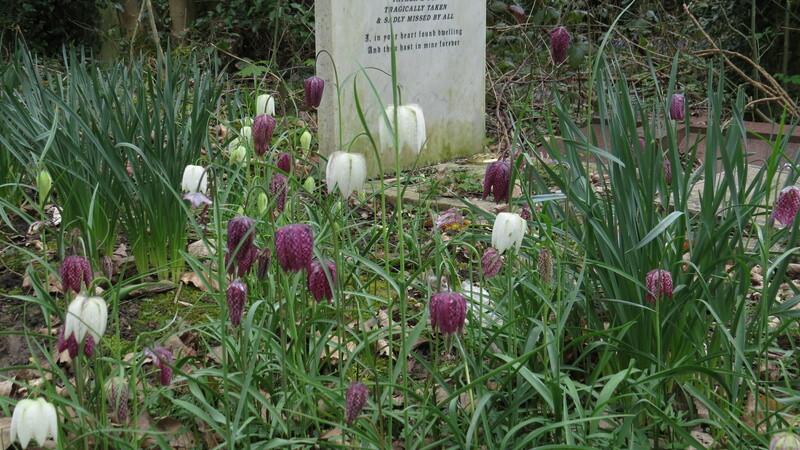 I fairly skipped back to my house, passing en route a lovely patch of fritillaries, which may well crop up in a Wednesday Weed at some point in the future. 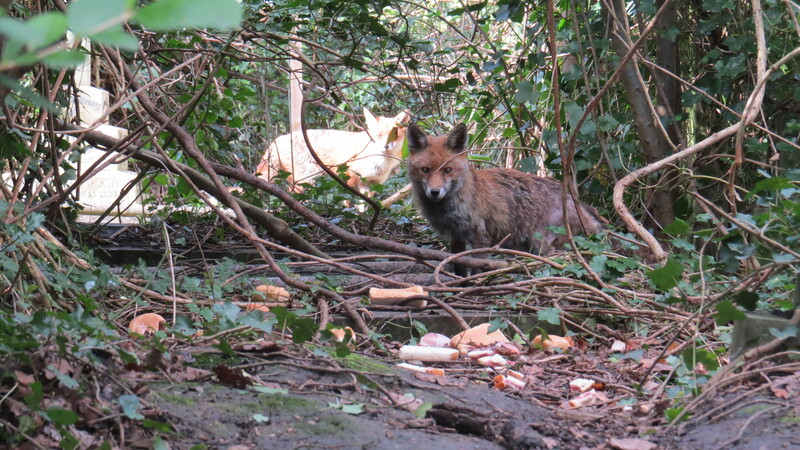 The next day, bearing an additional sandwich, I walk down to where B feeds the foxes. I’m a little late and I don’t see B, so I creep down to the feeding spot, behind the grave with the full-sized stone Labrador on it. This unlikely memorial celebrates a man who died rescuing a dog from drowning, and is always adorned with artificial flowers. A very skinny, mangy fox watches me briefly from the other side of the hedges, and then crosses the path at a trot. I sit down with my camera. This is not ‘my’ fox, but I remember what B mentioned about one healthy fox, and two mangy ones. I see the fox again among the gravestones, just his ears and one bright eye. Then he’s on the move again, looping round behind the bins where the cats live. I sit a little longer. And then he’s back in the hedges, eyeing up the jam sandwiches with obvious longing. I spot B making her slow progress towards where she feeds the cats. She raises her stick in greeting. I stand up and walk over, leaving the fox to his snack. ‘I’ve got something to tell you,’ says B. I have always liked the way that she looks at me directly, honestly. ‘The Dog Unit man said he found a dead fox further up the road’, she says, and pauses. ‘A fox with mange’, she adds. I have to look away for a moment. ‘Martin thinks he was run down’, she says. ‘The cemetery people will take the body away’. B waves her hand vaguely. ‘He just said further up’, she says. And so it may be that ‘my’ fox is dead. My mind is racing. I wonder if the body is still there, so that I can know for sure which fox has been killed. But then, I know that it’s hopeless. I’m sure that the evidence is already tidied away. Even if I saw the body, would I know? And how am I going to cope with the unknowing? I am reminded of people whose beloved cats and dogs just disappear, and they never know what happened to them. But a fox is dead. The question is, what am I going to do now? B can tell that I’m upset, but she carries on fussing over her cats, bending over, pouring the food into their bowls. ‘A bit like people’, she says. Her husband and father are both buried in the cemetery, and B visits them every day. ‘Did you see that skinny little fox over there?’ she said. ‘He’s got the mange really bad’. And of course, my decision is made for me. ‘My’ fox, the one that drew me here, is most likely dead, but there are other foxes here that need help. Am I just going to give up now because all my hopes were pinned on one animal? There’s a rustle in the brambles and the skinny fox heads off at a brisk trot. His whole tail and hindquarters are bald. He looks back briefly and accelerates his pace, until he is bounding off. ‘Of course’, says B. ‘And I’ll see you at the weekend’. ‘Yes,’ I say. ‘Yes, you will’. This entry was posted in London Mammals, London People, London Places, London Plants on April 16, 2016 by Bug Woman. I am sorry to hear about the fox, but helping in any way is sometimes the best we can do. You’re right, Julia. As B said, ‘we do what we can do, and that’s all that we can do’. Thanks, Anne….it really does remind me how any illusion that we control things, especially with regard to wild creatures, is just that, an illusion. But it is has taken me into a world that I had no idea even existed, so that’s no bad thing. I’m so sorry about the fox – whether it was your fox or not – but so glad you’ve been found by another fox in need of your gentle administrations. And your new ally too…this is such a good, old fashioned story, isn’t it? Life reminds us sometimes of how to see unexpected things. Thank you for sharing. It is turning into quite an epic, isn’t it? Yesterday I saw the handsome fox and two very skinny mangy little creatures, so my work is far from done :-). Wow, a grey wolf! That I would love to see. The best and worst thing about Life is that is goes on almost regardless of what has been lost on its path. There will always been gains too, however, and your fox has led you onto other foxes, with or without need, and your blog has opened so many people’s eyes to the subject. There must be many a grateful recipient of those jam sandwiches too! My fritillaries have just come out – quite a feat on the fifth-floor flat! So true, Beach-Combing Magpie, and I’m delighted about your fritillaries, they are amongst my favourite spring bulbs, so delicate and pretty! And well done for growing them on the fifth floor, that’s very impressive…. In spite of such a sad turn of events, it’s heartening that you will continue your mission to treat the suffering foxes. I imagine there are many determined and caring citizens like you and B, who are making valiant efforts to help rid foxes of this condition. I hope you’ll return from your visit with your Mum and Dad to happier news from the cemetery. I’m so sad at the news of the loss of a fox, especially since it seemed to be on the road to recovery. I am glad that you intend to continue taking the jam sandwiches to the other mangy fox and hope he/she will be rid of that awful mange in the near future. Hope your visit to your parents is enjoyable. Oh, and thank you for the lovely photos of the butterflies in your post about the hairy bittercress, they were beautiful! I’m glad you liked the butterflies, Classof65 – I love the way that plants and insects interrelate, and always try to point this up where I can. I’m very sad about your fox. You are a kind soul. If everyone was like you, the world would be a better place. All the best to you! Can’t the Fox society arrange to place food with a sedative/sleeping pill in it, capture the sleeping ox and take it to a vet to have the mange properly treated? Mange is highly contagious – if one has it and rubs up against another the healthy one will get it, and it is a horrible way to die. Thank you for helping these poor creatures! Hi Sonia, thanks for commenting! I’ve had long discussions with the National Fox Welfare Society, and the problem is with placing a trap on public land, which is illegal. 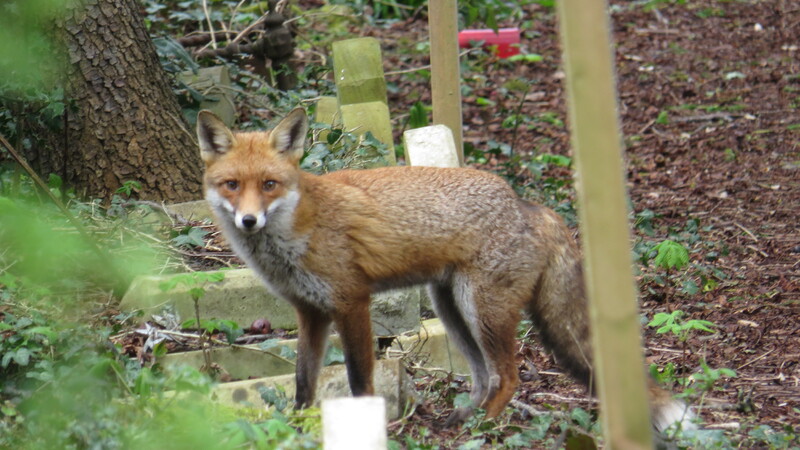 Furthermore, there are at least four feral cats and four different foxes who use the area, so the chance of catching the right fox would be very low. However, the NFSW recommend using the homeopathic remedy for foxes with less than 40% fur loss, which was the case with ‘my’ fox. Interestingly, it’s been shown that foxes don’t automatically get mange when they come into contact with infected animals – it’s thought that things like stress levels and diet determine how badly affected an animal will become. For example, in some litters some cubs are affected, and others are not, and often it’s the dominant animals who do best. So, all in all a complicated situation, with no easy answers, unfortunately. All i do know is that the remedy appeared to be working on ‘my’ fox once I worked out where to leave the jam sandwiches, at least until he disappeared, probably run down by a speeding car in the cemetery. Thank you! It certainly makes me feel better about humanity….